Both are cheats one a diver (Robben) (left), the other; an unrepentant biter (Dracula.sorry; Suarez) (right). SORRY does appear to be the hardest word in soccer – but try saying sorry and see how much a soothing salve the word can be. The word sorry – Dutchman Arjen Robben tossed it up rather more easily, something the unfortunate Uruguayan Luis Suarez was loathed to offer. As a result, Robben has escaped the wrath of FIFA scot-free. Suarez on the other hand, has earned the entire world’s opprobrium. (I put down the national rally behind his folly simply down to herd mentality in that country). 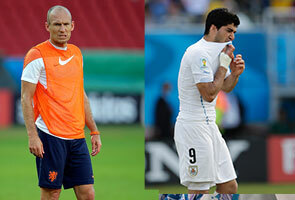 Both are cheats – one a diver (Robben), the other; an unrepentant biter (Dracula….sorry; Suarez). So attention was rather diverted from the big matches that took place on Monday with the winning teams vying for a place for the Round of 8 – the quarter finals. We leave out the travails of the two highly paid professionals whose discipline, lack of decorum and the surfeit of deceit in their character; colour, if not mar this World Cup. We marvel instead at the progress made by France in beating the best of Africa – Nigeria with a rather flattering 2 – 0 scoreline. This game was followed by the narrow 2 – 1 win – though victory was never in doubt – for West Germany against the North African tenacity, creativity and guile of Algeria. What can I say about the Gallic gallop in this World Cup. Love them, loathe them, you cannot simply ignore the snooty French team. Theirs is a squad that positively glitters – and I mean not just the outsized baubles nor the shiny trinkets the players wear to outshine even their wives and girlfriends. Each of the squad’s 26 players will walk into the first team of any European top club without doubt, such is their undoubted class, skill and talent. But Nigeria are such an enigma. Their players and administrators squabble over bonuses and appearance payments. Their footballers are on par, if not stronger than their opponents. What they lack is the cohesion and organization that will translate all that raw power into one coalesced centre of energy that can withstand pressure, and break down barriers. The French on the other hand have all those, plus the panache and elan to impress. What they lacked sometimes though, is personal discipline and singular minded purpose that team interests subsumes everything else. Superstars carry super egos and when the head rules the heart, that’s when things go awry, as in the past when it did. I mean, how can a team refuse to train, leave the pitch and board their bus to register protest; as the team did in the last World Cup in South Africa? So to be sure, France has come some way from all that infantile antics that so bedeviled the team. The team struts with all the confidence and maturity, coupled with all the technical qualities that is the hallmark of French football. Is it any wonder that the French export coaches the world over, a very sporty form of labour migration one might add. All they need to do now is beat Germany, the nemesis in the World Cup of the past. The Germans, as is their right on this world stage; beat a smaller team – Algeria; to advance. Algeria came to this game with every reason in the world to reek revenge. It was in the World Cup of 1982 that Germany and its Teutonic kin Austria stand accused of colluding to prevent Algeria from advancing to the next round. Algeria had beaten Germany in an earlier match and whoever made progress depended on the Germany – Austria result. In the event, Germany beat Austria 1 – 0; too conveniently coincidentally; as the narrow win against a compliant Austria saw both Deutsche-speaking nations advance, at the expense of Algeria. If this was an opportunity to put right a perceived wrong, Algeria showed they wanted to win more but as always, the German wall stood firm. It was only in time added on that the German (V)willpower (V)on! So on the quarter-finals, and the Germans will face France. Les Bleus will have a score to settle too. German keeper Harald Schumacher knocked France’s Patrick Battiston unconscious in the semifinals in 1982 Spain; an offence that went unpunished and the French duly lost. Sportsmen are seldom able to summon an iota of energy to express sorrow and say sorry. But then if they all become contrite and apologetic at every turn, sports might well be less of a spectacle than what we want it to be.